This understated and perfectly positioned cottage is an ideal intimate couples getaway. A peaceful and tranquil rural setting whilst only a 10 minute drive to downtown Nelson's shopping and dining. 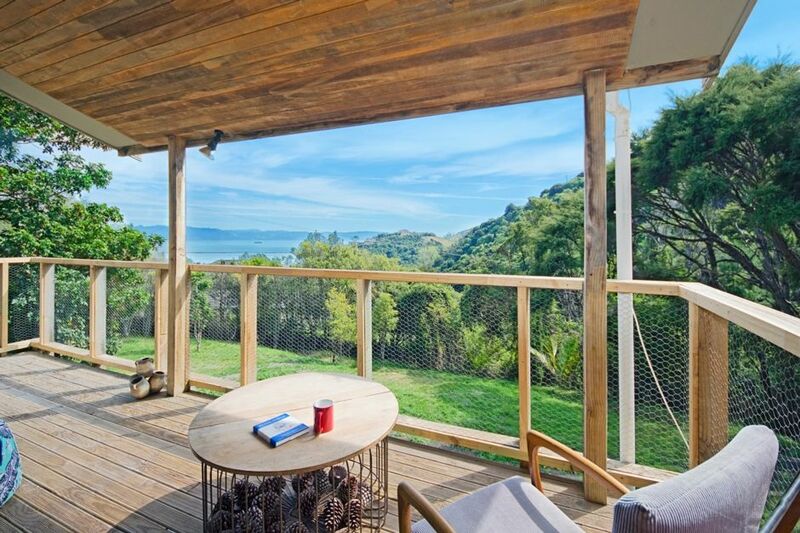 Surrounded by forested hills with abundant bird life, there are views of The Tasman Bay, The Boulder Bank, Nelson Port and the Mount Arthur Ranges. You can find glow worms just a 2 - 3 minute walk from the cottage along the private driveway. You'll love the fact that you are away from it all but yet only a 10 minute drive to the City if the mood takes you. This newly renovated cottage is cosy and warm with a fully-equipped kitchen, outdoor dining and private garden, free Unlimited WiFi with Smart TV, Netflix and Freeview Plus. Fern Cottage Escape will be presented with beds made ready for your stay. All utilities, linens and towels, use of property amenities including Unlimited WiFi Internet, pantry and sanitary basics, departure linen service and standard housekeeping up to 1.5 hours are included. Extra charges will apply where additional cleaning, BBQ or oven cleaning or excessive rubbish disposal is required. No minimum stay except 23 Dec ~ 10 Jan (7 nights) and Easter (3 nights). Shorter stays may be accepted by request. The bedroom comprises of a Queen Bed with beautiful bush views. The bathroom offers a shower and vanity with separate toilet. No party or venue use. No smoking inside. No pets. Children are welcome and we offer the free use of a highchair and babycot. Please request at time of booking. This property may not be booked for use as party or function venues. This property is made available on a per person basis andamp; only for guests that form part of the booking. Please Contact Us if you have any questions in regard to this policy or you need to update your booking details. We thoroughly enjoyed our stay here, Fern Cottage is cozy and modern with stunning views of the bay. The walk to see the glow worms was delightful and we loved being greeted by the friendly sheep each day. A beautiful place to have a relaxing holiday! You could not ask for more with this rental. Very relaxing with views to stay home for. Kitchen is equipped for cooking, the grill is a little on the small side but does the trick for two people. The welcome committee of sheep was also an added bonus. Beryl was easy to communicate with and helpful throughout the process. WHAT a place!!! Crisp and clean; incredible view of the Bay, excellent hosts and some endearing resident sheep who appreciate their snack kibbles. Wonderful stay! Wonderful cottage -nearly a retreat! Lovely respite in the hills with view of the sea. Very private and quiet! Exceptionally clean and well equipped. Attractive design. Great design with toilet separate from shower. Was fun to have the sheep visit! Our host was very helpful and sweet - we didn’t get to meet her but she checked on us via email and left treat for Valentines Day. Would stay here again! We enjoyed our stay very much. The cottage is spacious and well appointed, with lovely rural views and total privacy. There was no washing machine for clothes, which would be a problem for a long stay. Also rubbish disposal was a problem, as guests are asked to take bins to the road, almost a kilometre away, which in our view is unrealistic. Thank you for taking the time to review your stay. Just a few corrections there is a washing machine and a clothes dryer which was located in the purpose built cupboard. This was also stated in the arrival instructions emailes to you before arrival. 99 % of the time we take care of the recycling but as you are located in a rural setting this would be the normal practice here.